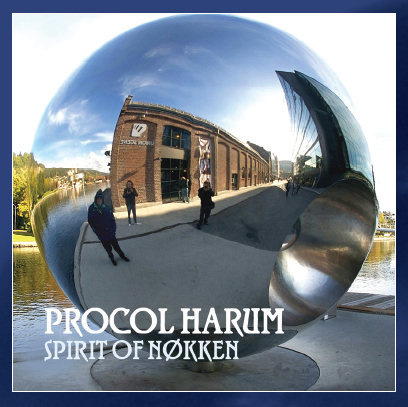 Procol Harum’s previous seven live collections – from Canada (Live in Concert with the Edmonton Symphony Orchestra, 1971 LP), from their native London (Live at the BBC, 1974 CD, and Live at the Union Chapel, 2003 DVD), from Utrecht in the Netherlands (One More Time, 1992 CD), from their Danish ‘home-from-home’ (Live in Copenhagen, 2001 DVD, and In Concert with the Danish National Concert Orchestra and Choir, 2006 CD/DVD) and the download-only collection, One Eye to the Future, recorded in Italy in 2007 – have all shown that some­thing magic persistently happens when the compositions of Gary Brooker, Keith Reid and co. leave the studio to blossom in front of live crowds of any nationality. Spirit of Nøkken continues that dynamic tradition. The bulk of this hour-long album comes from a gig played in St Petersburg on 14 October 2009. The 4,000-seater Octyabrsky Concert Hall dates from 1967 – like Procol Harum itself, though the band’s foundation was unconnected with the October Revolution’s semicentenary. A very Procol-savvy audience warmed to the melodic energy of TV Ceasar, the raucous carousing of Beyond the Pale, and the exciting bluesy soloing (using all three lead instruments) on the rare Taking the Time; another choice rarity, the melancholy keyboard-dominated Barnyard Story (thrillingly expanded since its 1970 début), was followed by the intricate compositional drama of Whaling Stories, and the alchemy persisted as the perennial A Whiter Shade of Pale morphed out of a stirring reading of Alexandrov’s National Anthem of the Russian Federation. On 8 October Procol played in the town hall at Hagen, North-Rhine Westphalia (birthplace, as it happens, of the founder of The Hallé Orchestra, with whom the band played in 2001). The German audience – reinforced by a “noisy Norwegian” from www.procolharum.com – enjoyed the amazing guitar/percussion empathy of the two Geoffs on the brutally-impassioned Wall Street Blues, a four-chord rant whose mature heaviness (and Parental Advisory lyric-change!) makes 2003’s album version, recorded with an earlier line-up, seem something of a sketch. Gary Brooker’s financial recommendation, however, is to be taken ‘in the spirit in which it was made’ – listeners invest “in Western Gambia” at their own peril! Kaleidoscope, recorded on 10 October at a culture-centre in Drammen, near the Norwegian capital, presents a similar evolution of the recorded original. The Commander’s pre-song patter sometimes seems bafflingly oblique, but tonight’s reference to “sticking your head inside a silver ball”, and the applause that greets the spooky Kaleidoscope introduction, make good sense once you’ve seen ‘Elveharpen’, Drammen’s 2008 interactive riverside art-installation (designed in California, but made in China, where they have the metallurgical know-how to blow thirteen-foot spheres). The ‘Living Lenses’ sculpture-collective treated the Ypsilon suspension-bridge, right by the evening’s venue, as a gigantic harp: sensors capture footsteps crossing its hundred-yard span, and hidden computers relay them – mingled with river-sounds and the wind in the wires – to resonate inside the steel balls. Here they blend with local voices singing to the legendary shapeshifter, Nøkken, who plays his Hardanger fiddle in rivers or under waterfalls, and lures un­wary listeners into the deeps. Procol Harum, photographing the spheres, were taken by the ghostly keening, and recreated it at soundcheck to book-end Kaleidoscope. As with the Alexandrov in Petersburg, this imaginative local homage made the evening’s magic even more potent. When will rock radio-stations finally ‘get’ Procol Harum, their subversive humour, their virtuosity and their supreme heaviness? Let us hope the Spirit of Procol, as heard on these sparkling live tracks, will lure all listeners – if they venture ‘across the bridge’ – into the depths of their superb music. Tracks available through 'Beyond the Pale' are encoded at 320 mbps; this is twice the bitrate of standard iTunes downloads. There will be no physical CD of this live set: the download is the only version.